The Transatlantic Trade and Investment Partnership (TTIP) is being promoted as a massively ambitious trade deal between the United States and the European Union that will tackle sluggish growth and widespread unemployment on both sides of the Atlantic. But there is no clear indication that the TTIP will directly generate jobs, despite the growth that is predicted to result from it. In the past couple of decades, in both the European Union and the United States, the benefits of economic growth from trade have not been shared equally. They have been largely absorbed by the richest nations, with profits lining the pockets of the wealthiest 1%. In the past four decades, there has been a massive shift of power all over the world from public to private interests, an increase in economic and financial liberalisation, and growing inequality, poverty and environmental degradation. Agreements such as the TTIP, the Comprehensive Economic and Trade Agreement (CETA) between the European Union and Canada and the international Trade in Services Agreement (TiSA) contribute to these trends by making it very difficult to revoke the extensive rights granted to private companies to do business as they see fit. Civil society groups in both Europe and the United States fear that these agreements will directly undermine the protection of public interests, including social and civil rights, the environment and citizens’ health. They could make it impossible to deny the privatisation of public services and common assets, while granting corporations greater power over our governments. These are issues of concern for everyone, so the struggle to stop these agreements and make the secretive negotiations around them transparent, is now supported by a wide spectrum of social movements concerned with austerity, climate change, food security and social justice. A self-organised European Citizens’ campaign has recently collected more than three million signatures against the TTIP and CETA, uniting people from every corner of the European Union around the common cause of protecting their fundamental rights. 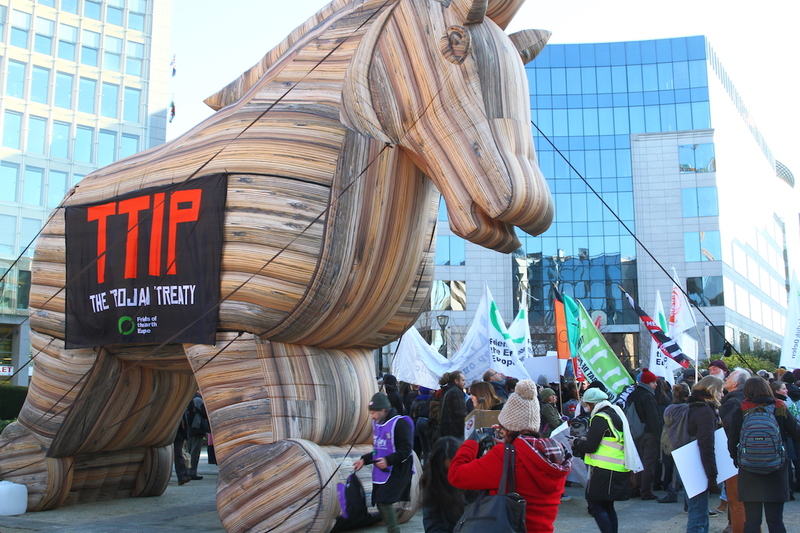 The TTIP is generating a range of problems that everyone should be worried about. The attempt to merge the world’s two largest free trade areas puts at risk any effort at sustainable development by poorer countries. With their shrunken economies lacking the rigour and capacity to compete with richer nations, the worry is that they will have to sacrifice human and workers rights, as well as the environment, in order to be able to coexist in the enlarged market space. Greece, in particular, having suffered a major blow from within the Eurozone, is again one of the weakest links. Due to poor management of a prolonged, systemic economic and social crisis – the most severe since the Second World War – the country has lost 25% of its GDP in the past five years. This recession rollercoaster has blasted unemployment to an astonishing 25.2%(June 2015), the highest among EU member states. With public health, education and social welfare systems dismantled, and with significant gaps in environmental and investment policy, Greece is increasingly vulnerable to the free-trade pressures of Europe’s richest nations, which will be reinforced by the TTIP. Greece’s natural environment is its strong suit, supporting chief economic sectors, such as agriculture and tourism. It must be at the heart of any effective and sustainable development policy. However, environmental, agricultural and food policy in Greece has long been characterised by a frantic circumvention of key environmental principles, such as making the ‘polluter pay’. This has been coupled with major gaps in the legal framework for environmental safety, particularly in the case of land use management and the protection of forests from construction activity. Urgent policy issues regarding the environment and sustainable economic growth have been put to one side, leading to a lack of action in major areas such as climate change, energy, solid waste management and biodiversity conservation. Consequently, although the country is in desperate need of investment to overcome its debt crisis, the only protector of its natural resources nowadays is the actual lack of investor interest. Were investment forthcoming, the current environmentally destructive framework for assets licensing and monitoring would degrade the country’s natural resources further. This does not seem to bother Greece’s political elite, which is trapped in a logic of pushing certain big corporate interests through fast-track processes while making no attempt to encourage entrepreneurship in sustainable development. This can clearly be seen in Greece’s agriculture, food and tourism sectors, which are developing with little regard for environmental laws. Opaque licensing decisions are being granted across the country’s landscape. Illegal beach constructions for seasonal summer business are just one example of how land use rights are being given away to commercial activities such as beach bars, canteens and sunbed rentals, often within Natura 2000 areas. This is happening without any efforts to avoid the erosion of fragile ecosystems, and despite environmental protection provisions demanded by the State Council. An attempt by the last conservative government to pass a law that would allow ample privatisation of coastlines was unsuccessful, but it was viewed by many as a stress test for reactions to further corporate control over the country’s resources. This situation describes exactly the kind of unregulated, neoliberal economic model envisioned by the TTIP and CETA. It also reflects the agreements that successive Greek governments have signed over the past five years with their international creditors – namely the European Union, the European Central Bank and the IMF. The ultimate goal of successive bailout programmes for Greek banks seems to be the sell-out of the country’s natural assets to multinational corporations. This occurs through a fund created especially for the purpose, offering land assets and public infrastructure for sale at prices that no one can comprehend. These bailout agreements do not have the consent of the vast majority of the Greek people. Citizen’s voices are being bypassed in the closed and largely opaque decision-making processes of their creditors, just as with the TTIP. The defeat of democracy in Greece was made evident during July’s referendum on whether the government should say ‘Yes’ or ‘No’ to a new bailout agreement. A resounding ‘No’ from citizens was ignored by politicians within a few days, as they struck a humiliating new deal with creditors. Bypassing citizens’ demands seems to be business as usual for EU leaders today, who lack the moral and intellectual capacity – and above all the vision – to deliver policies that serve the public interest. Instead, they are beholden to their corporate relations, prone to giving in to the desires of big-business lobbyists that stroll the corridors of Brussels. Such lobbying drove the reform process of the Common Agricultural Policy too, blatantly ignoring the voice of civil society calling for a greener and fairer agricultural policy. Something similar is happening now with the TTIP negotiations, as hundreds of corporate lobbyists draft a mammoth trade deal, that nobody – not even EU ministers – is allowed to read. The TTIP, CETA and TiSA will not only have an impact on jobs, food standards and the environment. The agreements could also affect internet freedoms through copyright enforcement provisions that threaten users’ right to free expression, privacy and access to knowledge online. Further, the agreements will extend rights to multinational corporations, allowing them to sue national governments in secret tribunals if they pass laws that affect company profits. Big pharmaceutical companies will be able to develop monopolies for drug patents that could drive up the price of treatments for illnesses such as cancer, malaria and tuberculosis. Worst of all, these free-trade negotiations are not subject even to the pretence of public consultation, scientific justification or legal support. The decision-making processes underlying these trade agreements, and the philosophy behind them, are similar to those that trapped Greece in a never-ending debt crisis. Unfortunately, the world has not paid enough attention to what has happened to Greece in the past six years. Instead of turning the crisis into an opportunity to build a sustainable and inclusive new economy, Greek governments have attempted with great intensity to sell the country’s most valuable assets at cut-rate prices. Of course, there are EU governments, like Germany, that are benefiting from this situation, claiming that it is the best and only path forward. Unsurprisingly, the same governments fiercely support the TTIP. The steady but gradual corporatisation of Greek society is becoming evident in all major sectors of the economy. At the same time, we see political inaction on the environment, a collapse of the health and social welfare systems and a lack of hope for the very possibility of a recovery. The rest of Europe should learn lessons from the painful experience endured by the Greek people before embarking on a future shaped by the TTIP, in which power is handed over to the corporations. Originally published on the Sustainable Food Trust and republished on The Ecologist. ← Decarbonisation, Net-Zero Emissions and Biomass = Business as Usual?